Case starred as a free safety at Northeastern Oklahoma A & M, which won a national junior college championship during his freshman year, and transferred to Oklahoma, where he was shifted to cornerback and intercepted eight passes as a senior in 1983. 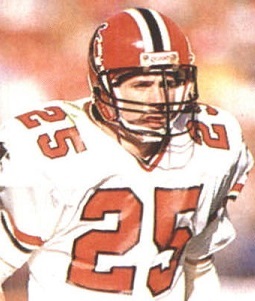 He was chosen by the Falcons in the second round of the ’84 NFL draft and moved into the starting lineup at strong safety in his second year, intercepting four passes and gaining credit for 95 tackles. Case moved to cornerback in 1986 with good results, displaying savvy and toughness if not great speed. After four seasons with the Falcons, he had intercepted nine passes and accumulated over 250 tackles. Falcons went 5-11 to finish fourth in the NFC West. Following a lesser season in 1989 due to nagging injuries, Case moved back to free safety in ’90 and continued to overachieve until diminishing skills, especially speed in pass coverage, cost him his starting job in 1994, his last year with Atlanta when he was used primarily as a nickel back. Case spent one last season with the Dallas Cowboys in ’95, ending his career with a Super Bowl appearance. Overall, he played in 178 games, starting 124 of them, and intercepted 30 passes, one of which he returned for a touchdown. Case also recovered seven fumbles and was credited with 7.5 sacks as well as over 900 tackles. 1988 remained the only season in which he received postseason honors.